When you look at the Earth from a distance, like anything, it appears much smaller than when you look at it up close. At ground level, we look around and feel the sky is immense, the reassuring cerulean blue limitless. But if you climb to a certain altitude within Earth’s atmosphere, you can see very clearly how thin is the layer of life-supporting compounds. Human beings are not extremophiles—organisms that thrive in the harshest chemical and temperature conditions we have observed. The realm where life as we know it is possible—our habitable world, our biosphere—is why we are able to be here at all. In the photo above, you can see how the sky darkens above a certain height. This is the thinning of the atmosphere. The sky is blue during daylight hours, because the molecules of air in our atmosphere scatter shorter-wavelength blue light more than other wavelengths of visible light. The denser air catches and refracts more light. As the air thins out, there is less light caught and refracted, and so we see more directly into the dark space beyond. Outside this narrow ribbon of light-catching life-giving air, there is something much more vast: a universe in which the conditions necessary for our survival are not the rule. The legendary Chinese field general and thinker Sun Tzu, in his landmark treatise The Art of War, argued that, whatever one’s circumstance, whatever one’s aim, nothing close to the optimal outcome would be feasible if one does not know the terrain well enough. So, to come out ahead in any struggle, knowing the terrain must be paramount. And that advice extended beyond the geophysical terrain—the local landscape, weather patterns, routine or unusual angles of light and other factors—to the terrain comprised of human character. We must know what has value to us in our surroundings and also what has value within ourselves or within those close to us or against whom we must struggle. There are tactical and strategic constraints that arise from starting the battle atop a high cliff or coming in from the sea. And other constraints arise because as human beings we might have a tendency to miss an important detail, or to see it just a little too late, or to routinely misjudge our own security or advantage. We must know ourselves, our surroundings, what threats we face, how they might align against us, and of course, we must know our margin of error. For most of human history, commerce was either controlled by powerful, well-armed elites, or was conducted in a way where those buying and selling could focus only on the mathematics of their own immediate interests. Whether the environment was in good ecological health was not an obvious commercial concern. Merchants could enter a market, extract the maximum value, and return home, without accounting for ripple effects or long-term degradation. Now, we are too connected for anyone to expect to operate in that way. Thoughtless—or maybe: overconfident—consumption has brought the threat of irreversible collapse of Earth’s natural life-support systems alarmingly close. Many sectors are already facing higher costs and real existential perils from the ongoing degradation of life-support systems across the world. A friend of mine just left his position with a major oil company, to volunteer full-time with Citizens’ Climate Lobby. He did this, because—despite his love for colleagues—he felt the moral conflict was becoming too deep. Instead of deep moral conflict, he opted for deep citizenship. When you recognize that all that we depend on is so delicate, so exposed, so consequential, and that we have misjudged our own security and advantage in such a serious way, you see our ability to thrive is entangled in the chemistry of our atmosphere and oceans. 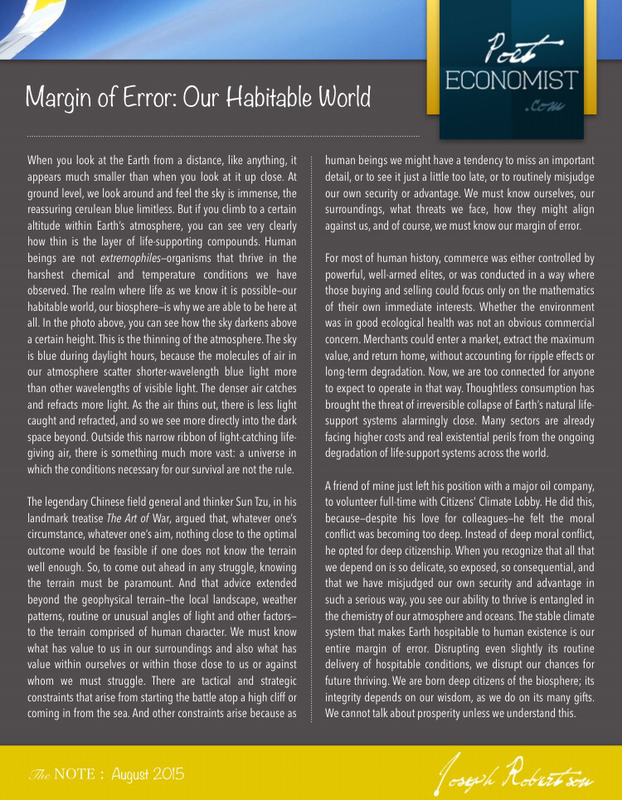 The stable climate system that makes Earth hospitable to human existence is our entire margin of error. Disrupting even slightly its routine delivery of hospitable conditions, we disrupt our chances for future thriving. We are born deep citizens of the biosphere; its integrity depends on our wisdom, as we do on its many gifts. We cannot talk about prosperity unless we understand this.